Calling all snow globe fans! This charming little Nativity scene makes an ideal stocking-filler, or a fun addition to your Christmas decorative displays. Keep those snowflakes swirling! Height 6.25cm. 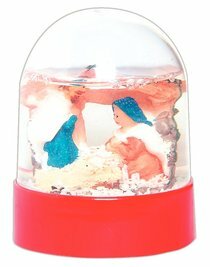 About "Christmas Plastic Snow Globe Red 6.25Cm Height"